His Divine Holiness Sri Nithyananda Paramashivam is the current spiritual leader of Adi Shaivism, the oldest spiritual tradition in the world, dating back to the Indus Valley Civilization, and beyond. With 1.2 billion followers worldwide, Hinduism is the 3rd largest religion in the world. His Divine Holiness belongs to the ethnic subsect of Hinduism – the AdiShaivite Minority Tradition (ASMT), which has 827 million followers worldwide. This document is an attempt to present the verifiable statistics of His following, backed by documentary evidence. The worldwide online following through websites, YouTube, Facebook, other social media platforms, television shows, magazine subscribers and online students of Nithyananda Hindu University (NHU). His Divine Holiness has delivered over 200 mass public satsangs (spiritual talks), and 2000+ discourses totalling approximately 17,000 hours. In 18 years, over 40 million followers have attended these public satsangs and discourses. The ASMT community is a vibrant cultural one with its ideology lived as a festive celebration of Existence and Oneness with the Divine. Traditional festivals and huge social gatherings are the hallmark of the ASMT community. Four major ‘Brahmotsavams’ or celebrations on the auspicious occasions of traditional festivals during the year comprise huge congregations, where ASMT members from all over the world come together to celebrate their culture. Over the centuries, multiple barbaric invasions led to the destruction of our ancient knowledge transmission centres, which were epicentres of learning, storage of ancient wisdom, and a place for the cultivation of scriptural expertise. These centres cannot be equated with what we call as Universities today. A knowledge transmission centre is one where a certain understanding and experience is received by the student through a direct download from the Cosmos itself. It is a mystical science which is being revived today by His Divine Holiness Sri Nithyananda Paramashivam. Nithyananda Hindu University was established with this intention, to make an ancient way of learning available to humanity once more. It was conceived in 2001 and legitimized as a University in the United States in 2007. Today Nithyananda Hindu University is the largest Hindu University in the world. Give the masses an experiential understanding of the Science of AdiShaivism and establishing research institutes. Youtube is one of the most popular platforms for learning and exploring spirituality and Hinduism today. His Divine Holiness has a strong presence on Youtube, with a majority of his followers discovering the authentic Hindu teachings delivered by Him through Youtube. With a strong following on Youtube, His Divine Holiness has made all of his discourses, programs, Satsangs, Yoga classes, and other sessions available on Youtube. All of His Divine Holiness’ teachings can found completely free of cost on Youtube, where it has been made accessible to a large mass of people. The teachings of His DIvine Holiness have been shared with the world using Youtube through multiple channels. As the spiritual leader of the ASMT community, he has trained several disciples and monastic members of the community as social media ambassadors, who have also shared the sacred science of enlightenment with millions all over the globe in their native languages. The YouTube viewers comprise the YouTube channels of His Divine Holiness, Nithyananda sangha and all the related and affiliate channels. When examining those videos containing hate speech or defamatory material against His Divine Holiness, we can see that only 5% of the views on these videos result in likes. 95% of the views are of those followers of His Divine Holiness who watch these videos out of concern regarding the false information or hate speech propagated about their spiritual leader. His Divine Holiness had a huge online presence on Facebook and other social media platforms. Social media has been an invaluable tool in reaching out to millions of people in an extremely easy and user-friendly way. We live in a world where many third world countries suffer with a lack of basic communities, but can still access Facebook. His Divine Holiness has been able to spread his message of imbibing powerful cognitions to millions jsut through social media. Not just through his official Facebook page, but also through those of his social media ambassadors, His Divine Holiness has been able to reach 28 million regular Facebook followers who watch His discourses videos and teachings and experience His divine presence and personal guidance. Millions have found spiritual hope, healing, powerful cognitions and divine presence, giving them a breakthrough path of enlightened living just by listening and internalizing His teachings. The websites of His Divine Holiness are knowledge repositories and have solutions from birth to death targeting children, women, social and health issues through the science of power manifestation and powerful cognitions. These teachings are shared through a number of official websites. Analytics on these websites showed that His Divine Holiness had 2.5M visitors and followers for His website. His Divine Holiness Himself has appeared on numerous episodes of the Tamil Television show called ‘Nithya Dharmam’ in 2013. Apart from this, many of his monastic members have featured on regular shows on television, reaching out to viewers through dial-in segments, as well as through answering their questions live. Nithya Dharmam was a segment broadcasted to lakhs of people on a popular Tamil TV channel called Thanthi TV. His Divine Holiness himself hosted the show, speaking with and solving the problems of guests on the show. Nithya Dharmam was a series which went on for eleven episodes over the course of a few months. The spiritual discourses of His Divine Holiness were telecasted on Sadhna TV and Ishwar TV, a national satellite Television channel. His Divine Holiness has authored over 500 books in 267 languages, available in print and for free download online. His Divine Holiness has always believed that knowledge is free, and every book authored by him is available for download online. These books have been read by and benefited millions worldwide. These include bestsellers like ‘Living Enlightenment’ which had pre-sales bookings of 1 million, and 1 million Bhagavad Gita books were distributed worldwide in 1 month. Over the years, multiple print and online magazines were circulated freely to reach the teachings of His Divine Holiness and ASMT, in various parts of India and worldwide. Before 2010, the popular Tamil magazine Kumudam Reporter, with a state-wide readership of 1 million, published His Divine Holiness’ teachings in a popular series called ‘Kathavai thira kaatru varattum’. More than 25 million followers of His Divine Holiness attended the Major Kumbh Mela which happens once in 12 years (Mahakumbh like 2013 Prayagraj). As per Govt. Intelligence 25% of the population who attended Kumbh Mela came to His Divine Holiness’ camp for His Darshan (a glimpse of Him). Religious food offering: Free food is offered to all those who came to the relief camp. Fresh, vegetarian, sattvic food was offered to all those who came. Tiruvannamalai Aadheenam – Annadan (religious food offering) happens every month for thousands of devotees; over 15 million have been fed just in Thiruvannamalai. Shaivism is the source of all the further sub sects of Hinduism over the millenia and arguably all other major religions of the world. His Divine Holiness is the head of the oldest Shaivite monasteries in the world – the Madurai Adheenam and next to it, the Thondai Mandala Adheenam in the state of Tamil Nadu in Southern India. Tamil Nadu with a population of 70 million people is predominantly Shaivite. The communities collectively known as Saiva Vellalars (fundamentally agriculturists by profession who form more than 80 percent of any population in India) traditionally owe their allegiance and reverence to these two ancient Shaiva Adheenam. In addition to this, in 2007, His Holiness was appointed as the Mahamandaleshwar (roughly translates to country head) of the Mahanirvani Akhada and more recently appointed as the Acharya Mahamandaleshwar (global head) of the Atal Akhada. The Akhadas are the ancient “Apex bodies of Hinduism” and are the congregation each of hundreds of thousands of organizations. The Akhadas were established thousands of years ago by Sri Kapila, one of the earliest incarnations in Hinduism (the Divine in human form) and revived in 800 AD by another Hindu incarnation, Adi Shankara. The Atal Akhada is the oldest Akhada in the world and the Mahanirvani Akhada has the largest influence in the country and runs some of the most visited temples in India such as the Kashi Vishwanath Temple, the Mahakaleshwar temple in Ujjain and so on which each attract tens of millions of people from around the world every year. Many of the famous Sampradayas (Spiritual Sub Traditions) of Hinduism owe their origins to the Mahanirvani Akhada. Ramakrishna Paramahamsa, who was the inspiration of the Ramakrishna Mission which is one of the largest service organizations of Hinduism with thousands of centers around the world, was initiated by the Saint Totapuri of the Mahanirvani Akhada. Likewise Gautam Buddha, the founder of the Buddhist religion hails from this very same Akhada. The Akhadas conduct the largest gathering in the world in the name of faith, the ‘Kumbh Mela’, that happens every 3 years and a major one once every 12 years. The last Kumbh Mela that happened in 2013 in Prayag saw over 100 million visitors over the 2 month period of the celebrations. His Divine Holiness Sri Nithyananda Paramashivam is not only the Guru for the ancient mystical schools but also for the modern youth who are urgently seeking meaning in the ever-growing complex world and real solution to their complex problems of existence. He is the most watched Guru on Youtube and every day audiences across all age groups and religious affiliations from more than 120 countries tune in to watch His live webinars; which expound and reveal all aspects of human existence and Cosmic Truths. The Nithyananda Sangha runs more than 100 websites and numerous social media pages and various other social media platforms to reach out and spread the teachings of His Divine Holiness. His Divine Holiness has authored more than 500 books in 26 languages and all of these are freely available online for people looking for solutions to their problems. These constitute the largest repository of Hindu knowledge in the world. Isakki Swamigal was a great Yogi and Siddha (mystic expressing Superconscious powers) from Tiruvannamalai (The Avatar’s birthplace). Isakki Swamigal lived with almost no food, water or clothes all his life. He recognised His Divine Holiness at a young age and explored the Science of Vedanta with Him at Panchamukham (the five faces of the Arunachala Hill in Tiruvannamalai) on the mountain path. Isakki Swamigal’s great love and belief in the Five Peak Point inspired many of his devotees to develop their own special connection with this spot. After Issaiki Swamigal left the body, His Divine holiness became the inspiration for all the followers of the Guru Peetam (the sacred seat of the spiritual master). Thondaimandalam Aadheenam is one of the oldest living temple monastery complexes in the world, located in the northernmost part of Tamil Nadu. It was under the rule of Chola dynasty, South India during the first century CE. His Divine Holiness Sri Nithyananda Paramashivam supported the activities of Thondaimandalam Mutt (traditional monastery) right from the year 2003. The community of this Mutt reveres His Divine Holiness as their ‘Kula Guru’ (the spiritual master of the lineage) and worship Him. The Kolada Mutt is the age old traditional mutt, a spiritual hub for the followers of the Lingayat community, comprising 17% of the population of the state of Karnataka. The Mutt has its headquarters in the heart of the city of Bengaluru and houses the ancient Jalakanteshwara Shiva Linga, which is known to be thousands of years old. The Mutt has hosted the likes of great saints like Thiru Jnanasambandar. Pal Swamy mutt is one of the ancient monastery complexes of the ASMT community, which is a heritage property of an 18th century Sage named Palswamy. He expressed extraordinary spiritual powers such as disappearing in one place and appearing in another. He healed and enriched the people living in the surrounding community at that time. Shankara Mutt is located close to the famous Vaideeshwaran temple in Tamilnadu. Vedaranyam is named after Vedaranyeswarar, the presiding deity of the Vedaranyeswarar Temple, a Hindu temple dedicated to Shiva. Panchanadi Kulam in Vedaranyam served as housing for devotees. It fed devotees who used to visit the temple of Vedaranyeshwar (temple dedicated to Shiva, located in the town of Vedaranyam in Tamil Nadu, India). The total number of followers of His Divine Holiness is from the demographic data as per the communities and is shown below. Madurai Adheenam is the oldest living sanctuary cloister complex on the planet with a recorded history of 1500 years and an unwritten history of 3000 years established by Paramashiva Himself who is worshipped by the ASMT community as the manifestation of the ultimate superconscious energy in form, resuscitated by the illuminated warrior ruler Devi Meenakshi, the manifestation of infinite mother, who at that point led over a vast piece of India. The Adheenam possesses 4 antiquated sanctuaries and was till as of late the proprietor of the world popular Madurai Meenakshi Temple which the Government coercively reallocated. The Pontiff of the Adheenam (sanctuary religious community private complex) has an extraordinary obligation and impact over the general population of Tamilnadu besides the ASMT community members. His Divine Holiness is the 293rd Guru Maha Sannidhanam (spiritual head) of Madurai Aadheenam. 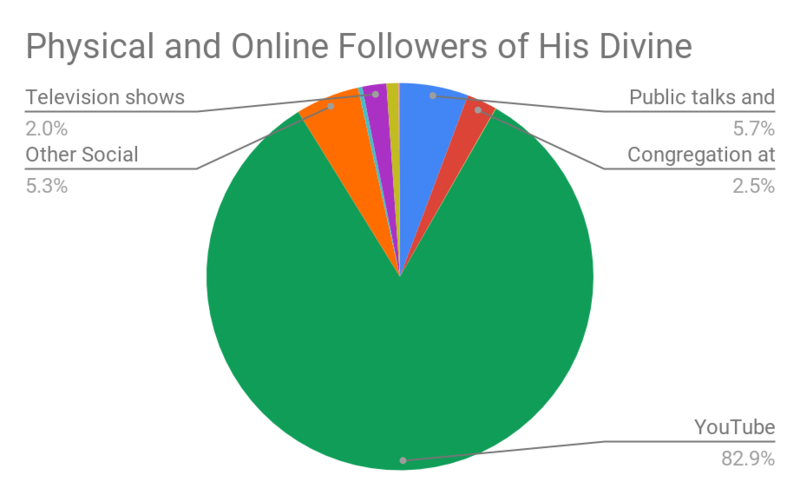 The total number of followers of His Divine Holiness is from the demographic data as per the communities and is shown below. His Divine Holiness Sri Nithyananda Paramashivam formally accepted the title and responsibility as the 1008th ‘Mahamandaleshwar’ (spiritual head) of the renowned Mahanirvani Akhada (Sri Panchayati Akhada Mahanirvani), the most ancient apex body of Hinduism founded directly by Lord Paramashiva (super-consciousness personified divinity), the original source of all Hindu spiritual lineages. It is Mahanirvani Akhada that organizes the most ancient ‘Kumbh Mela, the largest spiritual human gathering on earth. As the direct successor of Lord Paramashiva, His Divine Holiness is the youngest elected spiritual head of Mahanirvani Akhada leading 20 million followers, including 1.2 M ASMT monks . His coronation ceremony was held during the most auspicious Maha Kumbha Mela at Allahabad-Prayag, North India after a democratic election process, where all the 43 existing Mahamandaleshwar unanimously voted for His Divine Holiness. Mahanirvani Akhada, with more than one lakh (100,000) ASMT temples and monasteries, revived by Mahamuni Kapila, the incarnation of Paramashiva and Vishnu (the Hindu Divinities). It was also revived by the great Hindu incarnation Adi Shankara during the 8th century, with the aim of strengthening and uniting the lineage of warrior ascetics, sages and saints belonging to the ASMT. The Atal Akhada is one of the oldest Akhadas, the apex body of Hinduism founded by Lord Paramashiva (the Ultimate Superconsciousness who is the original source of all apex bodies of Hinduism), which is part of the Adi Shaiva Minority tradition (ASMT). It is closely associated with the Mahanirvani Akhada. There are seven Akhadas in Dashnami Sannyas (the monastic tradition of ten names), of which one is ‘Atal’. His Divine Holiness Sri Nithyananda Paramasshivam has been reverentially declared and honored as the ‘Acharya Mahamandaleshwar’ (the head for all spiritual leaders) of the Atal Akhada, as the direct successor of Lord Paramashiva. He is taken the rare divine responsibility of guiding millions of Hindu monks, ascetics, sages, seers and the followers of ASMT through this prestigious ancient Akhada. During the Kumbh Mela in 2013, 5 million Atal Akhada followers were recorded to enter the Akhada premise, all of whom are following His Divine Holiness as their Acharya Mahamandaleshwar.